NOW that we have pointed out how the Bible is as much a service book of the Anglican Churches as the Book of Common Prayer, and have explained why it is a good thing to have printed forms of worship, we are ready to look at the Prayer Book as a whole. What is the Prayer Book? We naturally turn to the Title-page and the Prefaces for our answer. Now the Title-page is a full and descriptive one; and at the very outset it removes a common mistake. It makes no mention of the Thirty-nine Articles; for they form no part of the Prayer Book. They are bound up with it, just as hymn-books often are; but it is a mistake of the printing authorities to compel us to buy the Articles whenever we buy the Prayer Book; and it gives Church folk the impression that the Articles are binding on them, which is not the case — for a layman is perfectly free to disagree with the Articles, if he chooses. They are admirable in many ways, comprehensive and moderate, though written in an age of bitter controversy; but it would be absurd to Suppose that they could not be improved after the discoveries and experience of three and a half centuries. Nothing has been done to improve them. The needs of modern thought have indeed been partly met by altering the terms in which the clergy (and they alone) have to give their assent; but this does not help the average Briton, who, moreover, is without the assistance of the learned commentaries which alone can prevent serious misunderstandings ; while in other countries, both East and West, the presence of the Thirty-nine Articles in the Prayer Book continues to do grave harm, by giving to other Churches a false idea of the Anglican theology. The Title-page, then, in the first place reminds us that certain familiar things are only appendixes added to the Prayer Book — the State Services, the Articles, the Table of Kindred and Affinity, not to mention the Canons of 1603, and the Metrical Psalms which used to be bound up with the Prayer Book until our modern hymn-books drove them out of use. The Prayer Book ends with the Form for the Consecration of Bishops; and nothing ought to be added to it but, the Accession Service, and any other services which may in the future have proper authority to be "printed and published and annexed to the Book of Common Prayer and Liturgy of the Church of England." (5) And the Form and Manner of Making, Ordaining, and Consecrating of Bishops, Priests, and Deacons. A truly admirable description! What a mass of ignorance would be removed if only people knew the Title-page of the Prayer Book! The notion, for instance, that "Priests" are a Roman Catholic institution, and the still common impression on the Continent of Europe that, the Anglican Church at the Reformation gave up the priesthood and is indifferent to Catholic order: the common idea, too, that "Sacramentalism" is a "high-church" idea foisted on to the Protestantism of England: or the notion that our proper use should be the Genevan Use, or the Roman Use, instead of that English Use which the Title-page orders. Certainly many widespread mistakes would never have come into existence had people but read the words that stare us in the face on this Title-page. Book 1. THE BOOK OF COMMON PRAYER. The "Common Prayer" is the name for those services which are conducted in the choir, (10) Morning Prayer and (11) Evening Prayer, which are therefore called choir services. There were formerly eight such services (see p. 150), and together they are called the Divine Service. Common Prayer also includes (13) The Litany, which is a service of Intercession after Morning Prayer, preparatory to the Holy Communion. CONTENTS-PAGE OF THE PRAYER BOOK. Between these two books of Common Prayer and of the Sacraments there are printed, besides the Litany:— (12) for use "At Morning Prayer," the Confession of Faith "commonly [but inaccurately] called the Creed of Saint Athanasius" ; (14) The "Prayers and Thanksgivings upon several occasions," which are used both in the Divine Service and in the Litany, and therefore are conveniently printed here ;. (15) "The Collects, Epistles, and Gospels to be used at the Ministration of the holy Communion, throughout the year," as they are described in the Table of Contents; the Collects, however, are used also at Mattins and Evensong. 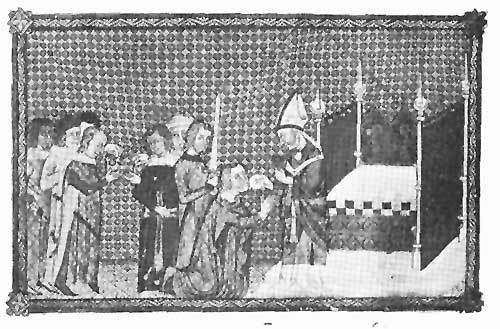 THE COMMUNION AT A CORONATION, 1365. The King kneels to receive the Eucharist from the Archbishop, who holds a pyx in his left hand. The crown is held by two courtiers. Book 3. OTHER RITES AND CEREMONIES OF THE CHURCH. It will be noticed that both the Gospel Sacraments and the "other" Rites, are described as "of the Church," services, that is to say, not of the Anglican Communion only, but of the whole Church; though their ritual (i.e. the manner of saying) and their ceremonial (i.e. the manner of doing) are according to the English Use. Furthermore, the Title-page does not say "All other Rites"; there are some which are not in the Prayer Book (pp. 47-52), such as the Coronation Service, or the Form for the Consecration of a Church, which are used under episcopal sanction. These Rites consist of certain of the "five commonly called Sacraments," namely (20) Confirmation, to which is prefixed (19) the Catechism, which is the preparation for Confirmation, and was only separated from it at the last Revision ; (21) the Solemnization of Matrimony; and (22) the Visitation and Communion of the Sick. Those who, like our brethren of the Eastern Orthodox Church to-day, look for seven Sacraments, will find on p. 45 how two of the lesser Sacraments come under this head, while the seventh is given in Book 5, the Ordinal. Then follow other Rites, (23) the Order for the Burial of the Dead, (24) the Churching, or Thanksgiving of Women after Child-birth, and (25) the Ash Wednesday service called A Commination. Psalms (26) which form the most essential part of Mattins and Evensong; they are arranged to be "read through once every month," by grouping them under Morning and Evening Prayer for thirty days. 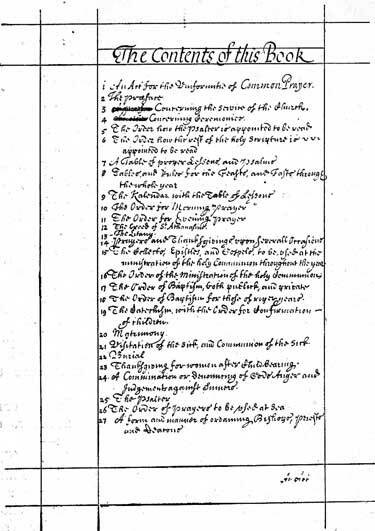 At the last Revision (1661) two sets of services were added— the Order of Baptism for those of Riper Years (18), and the Forms of Prayer to be used at Sea (27). The latter were inserted after the Psalter : it was doubtless felt that these sea services could not in the main be classed under "Other Rites," and would be too prominent if printed after Mattins and Evensong. None the less their present position is a strange one, since hey cannot be classed under Book 4 or Book 5. It would be better, perhaps, if they were printed among the Appendixes at the end. Book 5. THE ORDINAL (28) consists of three services, which were originally printed as a separate book, and published after the First Prayer Book was issued. These still have a Title-page (or half-page) of their own, in which they are described with definiteness and solemnity as " The Form and Manner of Making, Ordaining, and Consecrating of Bishops, Priests, and Deacons according to the Order of the Church of England." 8. The South African Church. 9. The New Zealand Church. 1o. The West Indian Church. 11. The Japanese Church (Nippon Sei Kokwai). 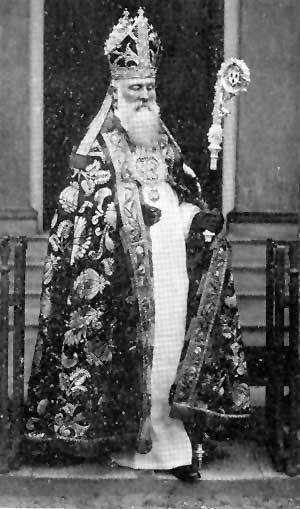 These twelve Churches, like the Greek, Russian, and other Orthodox Churches of the East, together form one Communion ; but, like the Eastern Churches, they are self-governing, and each has the inherent power to make its own Prayer Book,. though the position of some has not yet been fully regularised in a legal sense. At present, the last eight of these Churches use the Church of England Prayer Book ; but the first four have each a service book of its own. The Prayer Book of the Church of Ireland (1877) is but slightly different from ours : but the Scottish Episcopal Church has a very beautiful Communion Service, called the Scottish Liturgy (1637), which is more like that of the First Prayer Book than our own. The Anglican Church in America has its own form of the Prayer Book (1789), with a Communion Service partly adapted from the Scottish, and with many less important variations : the last revision of the American Prayer Book was in 1892. Recently, in 1912, the Scottish Episcopal Church has issued a new Prayer Book, consisting of the Church of England Book together with the Scottish Liturgy, many excellent additional Collects, Epistles, and Gospels, with other "Additions and Deviations." 1. BYZANTINE (a. Greek, and b. Slavonic, which is used in the Russian and other Slav Churches; c. Armenian). 2. WEST SYRIAN; 3. EGYPTIAN; 4. EAST SYRIAN. 5. ROMAN (a. Roman; b. Monastic [Benedictine], Cistercian, Carthusian, Dominican); 6. GALLICAN (surviving in the Mozarabic rite, partly also in the Ambrosian, with traces at Lyons). 7. ANGLICAN (a. English; b. Irish; c. Scottish; d. American). All these are families of books in use at the present day; but 2, 3, 4, and 6 cover a comparatively small number of people; and the books most widely used in the Catholic Church of the 20th century are the Roman, Slavonic, Anglican, and Greek.